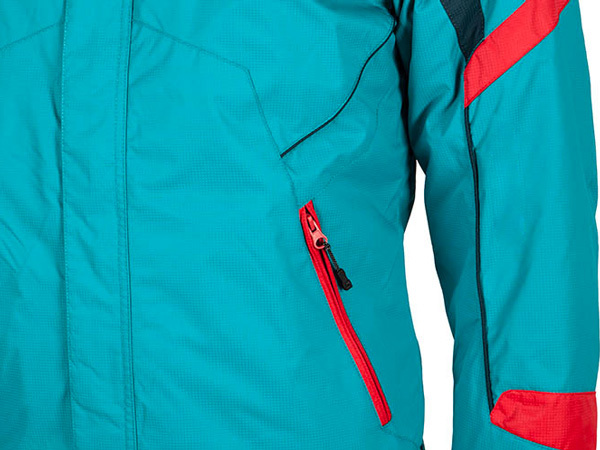 Softshell is an overall term for modern multi-layer materials used for sportswear and outdoor clothing production. 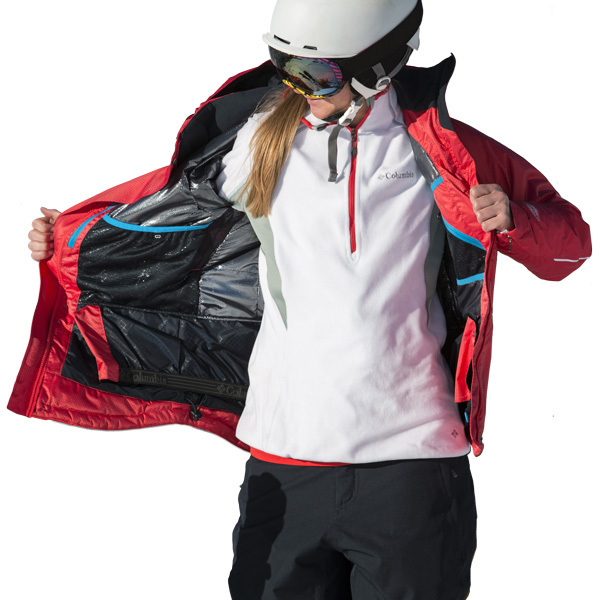 Softshell combines waterproofness, heat resistance, wind resistance and breathability. The inner side may be lined with a fleece lining as a thermal insulating material. At the same time it is elastic and does not restrict the movement. That is why it is popular as a universal layer for virtually any activity, from walking, running, cross-country skiing, biking to skiing. The purpose of the last and the upper layer of clothing is to protect against external influences (weather) and at the same time maintain the properties of lower layers. It predominantly protects from water (rain and snow), cold and wind. A waterproof coating is a non-permeable, yet breathable layer of polyurethane which may be applied on the surface of a piece of clothing. The coating has usually water column 2.000 – 5000 mm. The disadvantage of the coating is its tendency to degrade over time through frequent washing and general use, on the other hand it is quite affordable. Advantages: increases water resistance, breathable fabric, low cost. A membrane is a layer connected to the upper material on its inner side and is used for clothing in more demanding conditions. Water column is usually 10.000 mm and higher. 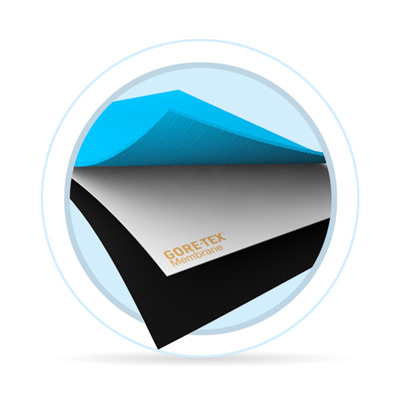 It is permanent and does not lose its properties even after long use (when properly maintained), but is considerably more expensive than water proof coating (Gore-Tex, Sympatex, Dermizax). 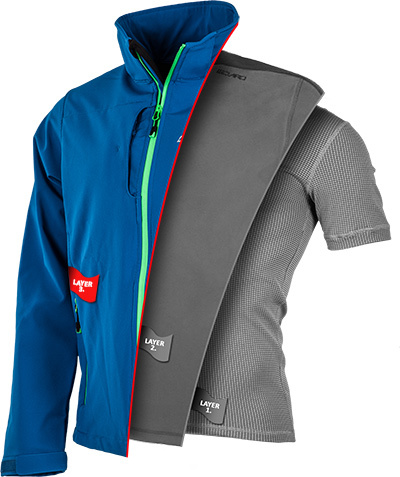 The outer shell material of the garment is densely woven to ensure protection from the wind. 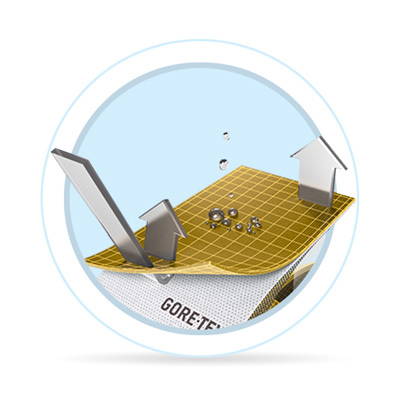 The membrane assists with the material's water resistant qualities, though in some cases, an additional special membrane may be used to combat the wind (windstopper, windlocker, windbloc, etc.). Protection from the wind is important because strong wind can significantly decrease surrounding temperature and cause hypothermia. A lining made up of either a membrane coating or a laminated layer of fleece provides thermal insulation for the outer layer. Another option is to use thermoinsulating filling which is usually made from hollow fibres - synthetic materials, which do not absorb moisture and maintain good thermal insulating properties in wet environment, while staying lightweight and low-maintenance. Down is used as an insulant in some cases. Even though it has outstanding thermal insulating properties, it is quite high-maintenance and considerably more expensive.